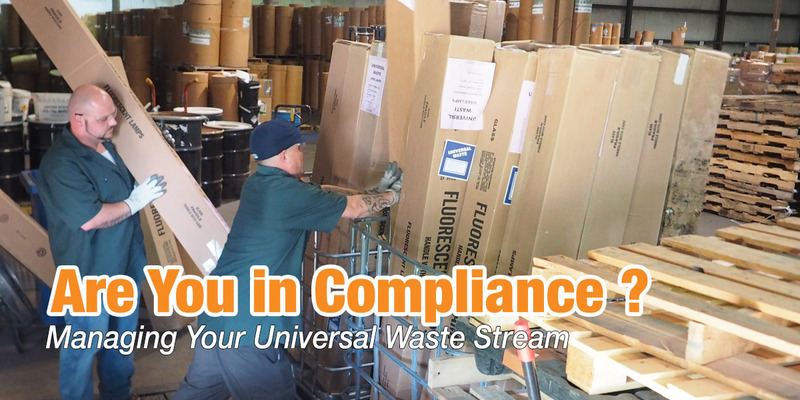 Are You in Compliance – NLR, Inc.
You are probably already well versed in traditional recycling programs, but in maintaining any hotel or large property, it is important and mandatory to recycle your universal waste as well. Universal waste is a class of very common wastes designated by the EPA that, when managed improperly, can be harmful to the environment. The most common types of universal waste that properties such as hotels generate are fluorescent lamps and light bulbs, electronic waste (E-Waste), and batteries as well as mercury-containing devices. Many other states have also welcomed covered electronic devices such as computers and printers, TV’s and CRT monitors and a host of other electronic goods. The common thread in all these universal wastes is that they contain heavy metals and other components, which can be recovered for reuse with proper procedures and technology that permitted destination facilities maintain. While not all lamps and light bulbs contain mercury, those that do can pose an environmental and health risk, especially in large quantities. Intentionally broken or improperly disposed of lamps release mercury vapor into the atmosphere, where it can be either inhaled by people in the vicinity or enters the water cycle returning as rain. Many hotels are undergoing retrofits to LED’s to eliminate the use of fluorescent lighting and implore the cost saving LED’s can generate. However, LED’s also have a number of electronic components that can and should be recycled. Many recyclers are already experiencing large volumes of early generation LED bulbs entering the waste stream. Despite their estimated lifespans being considered longer than fluorescent bulbs, end-of-life measures have already been introduced to capture the components associated with the proper management of LED’s. Batteries are so prolific you may not even realize how many devices around you either run primarily on battery power or have a backup battery. Most batteries contain hazardous chemicals and are regulated as universal waste. These chemicals can easily contaminate the environment if discarded with ordinary trash. Nickel Cadmium (Ni-Cd), Nickel Metal Hydride (Ni-MH), Lithium ion, Alkaline, and Lead-Acid batteries are a few that contain these hazardous chemicals. Batteries are a particularly difficult universal waste to manage because most consumers are unaware that batteries can become a fire hazard when stored improperly. Different battery chemistries must have their terminals taped to prevent risk of short circuits and simple steps like “source separating” can be taken to keep the chemistry types isolated. Both measures can help curtail the risk of a fire and other further consequences. Computers, monitors, and most E-Waste containing circuit-boards and microchips contain trace quantities of lead, phosphorous, cadmium, or mercury. While newer flat screen monitors may contain less levels of these metals, they still contain valuable resources like copper. Moreover, newer technology such as LCD monitors are backlit with a miniature fluorescent style lamp that also contains mercury. There is also the special consideration of data security for many electronics. The laptops and smartphones you dump contain private data such as passwords, bank details, home addresses, contacts and more. When these fall into the wrong hands, you could face devastating consequences as well as an organizational crisis. Each type of universal waste presents its own set of challenges for hotels and property owners. This is just a quick snapshot of the much more complex universal waste rules and we still haven’t covered lighting ballasts and other mercury containing devices. A permitted recycler such as NLR, Inc. is there to make sure you manage these regulated wastes properly otherwise, state and federal regulators can and will impose fines for improper disposal. Simple guidelines and signage are available for your storage area and a quick audit of your facility can help assist you in compliance for years to come. With over 25 years of expertise, NLR can support your facility and provide assistance so you stay ahead of the regulators. Compliance begins simply with a phone call or email. NLR’s many programs are available including on site pick-up, or convenient mail-back options, depending on what works for you!